Medical advances of the past century, ranging from vaccines to organ transplants to cancer treatment, were made possible by animal research. Animal models allow researchers to study complex systems that cannot yet be reproduced in other ways. Federal laws mandate that animal studies must be done prior to studies in humans, and thus, every new medicine for humans has gone through previous animal studies to ensure safety for human patients. 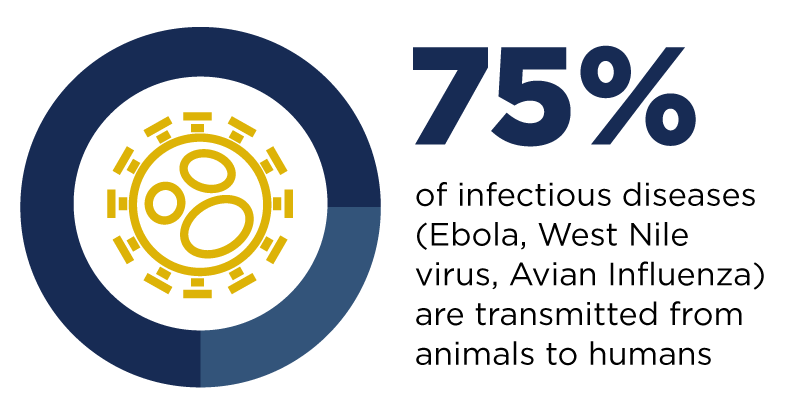 The One Health approach acknowledges that the safety and wellbeing of human and nonhuman patients is interconnected. As we understand more about animal health, we are better able to protect and advance animal health, human health and the two together. Research conducted with animals is highly regulated at the local, state and federal levels. Ensuring the welfare and humane treatment of animals used in ethically and scientifically sound research is a priority for the team of scientists, veterinarians, animal care personnel and university-based oversight committees. In addition to honoring their ethical obligation, scientists maintain the highest standards of animal care to ensure that research results are scientifically valid. Under federal law, UC Davis receives regular visits by inspectors from the U.S. Department of Agriculture, which is charged with enforcing the federal Animal Welfare Act. USDA inspectors visit both the CNPRC and other animal research facilities at UC Davis. UC Davis follows the National Institutes of Health guidelines for laboratory animal care. The NIH Office of Laboratory Animal Welfare inspected the campus facilities in 2013 and endorsed the program. The campus' animal care program is also accredited by the International Association for Assessment and Accreditation of Laboratory Animal Care (AAALAC). UC Davis is one of more than 770 research institutions and other organizations in 29 countries worldwide that have earned AAALAC accreditation, demonstrating the program commitment to responsible animal care and use. All research studies involving animals must be approved by the campus's Institutional Animal Care and Use Committee (IACUC), which includes public representatives as well as faculty and staff. The IACUC also inspects the facilities every six months. Research involving primates is also reviewed by an internal committee at the Center. This post is an excerpt of a longer article by Andy Fell, a science writer and associate director of News and Media Relations in Strategic Communications.